When the spice and herb processor requires a mill to be used for many different products, the Universal mill should be the first choice. This versatile mill is able to grind all herbs and spices. Herbs can be milled with the hammer attachment into any fineness required and when herb powders are required, the stone mill or plate mill attachments may be used also for very fine grinding or screens in the hammer mill attachment can be changed. Spices with high oil content or with high sugar content can be milled effectively with the plate attachment. 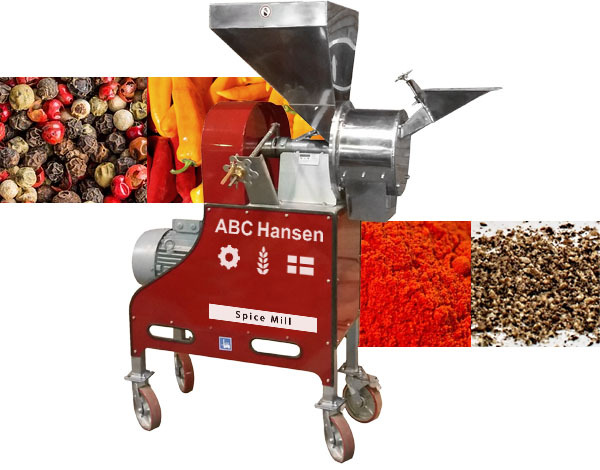 Higher capacity spices can be milled with one of the range of stone mills manufactured by ABC Hansen or with the wide range of Hippo hammer mills. Milling chillies and paprika as well as pepper can be daunting. The Hippo hammer mill range is virtually dust free and when systems are designed specifically for these purposes, can be made entirely dust free. Universal mills are made in stainless steel and chrome plated, contact parts. 600mm diameter and 950 mm diameter stone mills are also made with food grade stainless steel contact parts. This also allows for easy and proper cleaning and no rust build-up due to cleaning with liquids.